Jack & Jill has done its best over the last 3 years to highlight the madness of locating the National Children’s Hospital in the St. James’s; it is good to see others adding their professional, personal, sincere voice to the debate! “The location of the new children’s hospital is something that I care deeply about. Today, I’m a doctor who works in St James’s, but a decade ago, I was that sick child, travelling up from Galway to Crumlin for chemotherapy. I was diagnosed with non-Hodgkins Lymphoma when I was 14. During that awful time when I received excellent care in inadequate settings, the idea of a new, easily accessible hospital with ample parking genuinely delighted me. More than a decade after being that seriously ill child, I’m now a doctor. Not only that, but I work in St James’s. 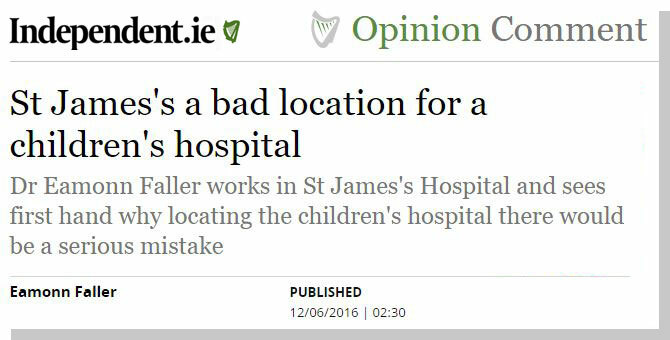 It’s a great place to work and a fantastic hospital, but it is not a suitable place for the National Children’s Hospital. The site is not just less than ideal, or only okay, it is catastrophically wrong. ‹ Hannah’s Food Company is supporting Jack & Jill by donating a percentage of sales!